Recently we got a chance to read Stuck in the Middle? 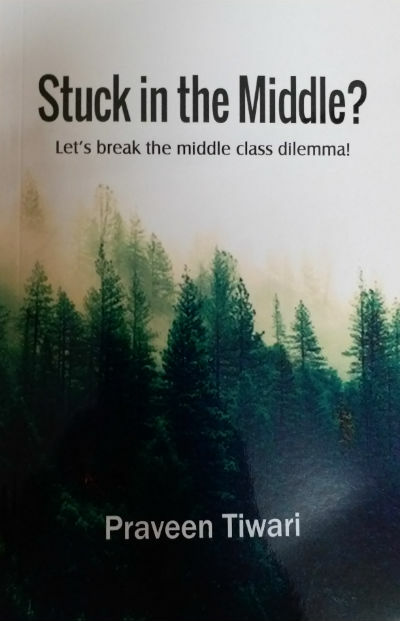 : Let’s break the middle class dilemma!, book by author Praveen K. Tiwari. Actually the author approached us to provide the book to read and share our unbiased and genuine reviews. So, here they are, without any influence(s). The book falls in Inspirational and Motivational Read category and it remains true to its genre. And yes, you can of course read our articles about various Commencement Speeches, where we found some of the interesting life lessons to learn. Book Title : Stuck in the Middle? : Let’s break the middle class dilemma! The book cover has a background of tall green trees with a white background where the book name is printed in black. The cover page is simple and doesn’t reveal much about the book. The quality of the cover page is really good. It is a thick page with glossy finish, which makes it durable. The book is published by BecomeShakespeare.com in association with Wordit Art Fund, so it is a kind of self published book with the help of funding agencies who help aspirational writers to publish their quality work (based on their criteria). Usually we distribute the book review in various segments, where in “The Plot” segment we try to take a bird’s eye view of the story explored in the book and then represent our views and reviews for the book. Based, on the nature of this book, we are combining both these segments together here. The first thing I like about the book is the quality of papers. In addition to cover page, which we talked about earlier, the internal pages of the book are of good quality too. Usually, we see paperbacks are having moderate page quality (that’s why they are paperback). Good page quality increases the book life. Another thing I like is, a few blank pages are given at the end of the book so you can take notes or write down important points there, while reading the book. This idea goes pretty well for self-help books, where the reader is expected to be active. The price of the book may remain a factor for buyers. As of now, I am unable to find paperback version on Amazon India (which is available on Amazon US though), but it can be available when you are reading this article. Reading this book is like witnessing a long session of Ted Talks! Actually, the good thing is all the chapters of the book are associated with each other, but complete in themselves, making them a good choice of independent read also. So, if you are a busy person and get time to read in chunks, you can keep reading a single chapter in each session. It makes it a good choice for the readers. The book is not for “timepass” read. Rather, I can say, it is a book which can be more helpful if you read it with interest. A problem with self-help or motivational books is, they often tends to become little boring. Here, Praveen weaves his life journey experiences as example of each point he is putting forward, making it interesting and more believable. When we hear about the phrase “middle-class”, the first thing that comes to our mind is a group of people who are neither rich nor poor. It is the major part of the society. And we consider the economical status of a person as the major deciding factor here, right? The author, however makes it clear that, when he refers the middle class in the book, he talks about mindset mainly. And, if you have experience it (which a majority of us have), we fall in this category (or at least, at that particular time). The author shares his growing up in a small town of Uttar Pradesh, studied in a government school there, the not-so-materialistic childhood and many other aspects, which a majority of readers will be able to relate to, at least, at some extent. The way he had discovered a new world when came to bigger city for higher education, is also written effective. All in all, the reader can establish an emotional connect with the book, and it is a major positive point for the author. You can be helped only when you want to be helped. … if you see a dream, build a passion towards it, and have the belief that by working passionately you can reach there. The communication starts much before you start to speak. It’s easier to advise someone else to do something than to do it yourself. The deprived class is always bigger than the privileged one, unless of course the quality in question is stupidity. We often see the advises of “follow your passion” or “follow your dreams”, but there are a very few talk about doing a reality check and planning steps based on the facts and situations. The author also insists readers to not to keep your mindset rigid, it should rather be open, and you should be able to accept the realities and change your way to achieve the goal, based on the current situations you are it. Get real and face things as they stand today. Don’t let your realistic ambitions suffer because “once you had this opinion about that”. While getting inspired by big names, don’t be blind in following them. This book talks about an interesting side of the life, which I found comparatively less talked about. It is the reality that once you start earning, the regular flow of money eventually changes your way of thinking and even the life style in a way, that you caught in a boxed mindset, that you cannot go out and think risking it to try out something new, despite seeing a potential in it. The earlier you create liabilities for yourself in terms of house, property, car, etc. the more difficult it becomes for you to break the salary route, that’s what a person closer to the middle class mindset thinks. I like the way the author defines the leadership qualities in the book. He, at places, gives example of Sachin Tendulkar and M S Dhoni. But, more interesting is the reference of Sudheendra Kulkarni talking about Atal Bihari Vajpayee. It shows the ideal way, a leader should act. Asking questions, even if absurd, is one way to generate new ideas. At the end of the book, you find a poem “Go middle class go“, which is moderately good. The author is a natural communicator and he is able to convey his message through this book quite well. The language of the book is simple yet effective. It seems that he can be an effective motivational speaker. Around 7 stars out of 10. A book with a substance, which is written in interesting manner. It inspires you but never bores you while reading. Not for a light reading.